A Grand Romp Amongst the Undead and Dracula’s Other Ghoulish Minions! 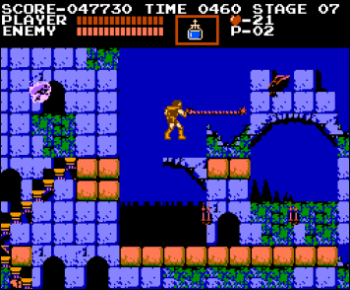 Back in 1987 a little known game called Castlevania was published by Konami for the Nintendo Entertainments System. From the opening theme to the gothic tapestry of environments you will be exploring, Castlevania just screams fun. Like most games of the 8-bit era, Castlevania is a pretty short and to the point experience. 6 levels comprise your adventure to hunt down the Dark Lord himself and can be finished in the course of a couple hours. Gameplay consists of basic platforming and using your trusty whip to send all enemies back to hell where they belong. You also have access to 5 subweapons; knife, holy water, stopwatch, cross, and axe. Each subweapon is useful in different situations. For example: the axe is great at taking out airborne enemies such as crows and flying medusa heads. The cross and holy water are amazing for dealing with tough bosses due to their ability to hit them multiple times per use. Subweapons require a certain number of hearts to use so you can’t rely on them most of the time. 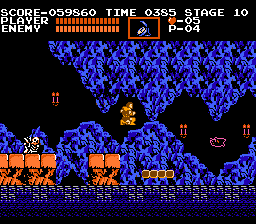 Hearts can be dropped from enemies, but in general are found in candles scattered throughout each level which can be destroyed using your whip. The haunting and blood pumping tunes are absolutely incredible when you consider that they are created from simple “blips” and “bloops” that were simply limitations of the hardware. Konami deserves the utmost credit for composing what could argueably be considered the greatest soundtrack of the 8-bit era. The music and sound design matches each and every level, boss, and action perfectly resulting in audio bliss. I mentioned earlier that the game’s 6 levels could be completed in the matter of a couple of hours, but let’s get real. This game is tough. Real tough! Levels 1-4 are hard but very doable with 1 or 2 continues by a seasoned gamer. Once you hit level 5 get ready to have your skills questioned. Running a gauntlet of the games most difficult enemies and then finish off with a battle to the death with Death himself. Every attempt and every continue used will test your patience to the limit until you become so acclimated to the level that you actually make it to the end boss without getting hit. Unfortunately that isn’t enough to save you because death is rather difficult in his own right flying across the play area and sending sickles from all directions. This wouldn’t be so bad if the control of your character wasn’t so stiff. Jumping is the biggest culprit here. You had better be sure you want to jump when you hit the A button because you are now completely committed for the next few seconds. You can’t redirect midair and this can be a real pain when there are several flying enemies out for your head. So while the levels are fairly short and sweet, there is a lot of replay value due to the difficulty at hand here. Don’t let that fact scare you away from a truly classic and quality experience though. The music and gameplay will keep you wanting to come back time and again even after completion.